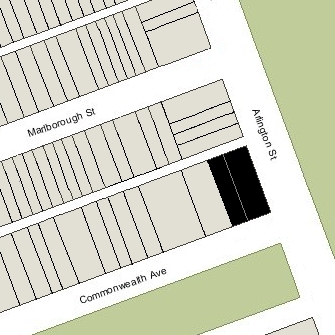 1 Commonwealth (12 Arlington) is located on the NW corner of Arlington and Commonwealth, with 10-11 Arlington to the north, across Alley 422, 2 Commonwealth to the south, across Commonwealth, and 3 Commonwealth to the west. 1 Commonwealth was built ca. 1861 and 12 Arlington was built slightly earlier, ca. 1860. The two houses were combined in 1893 and have remained one property since that time. 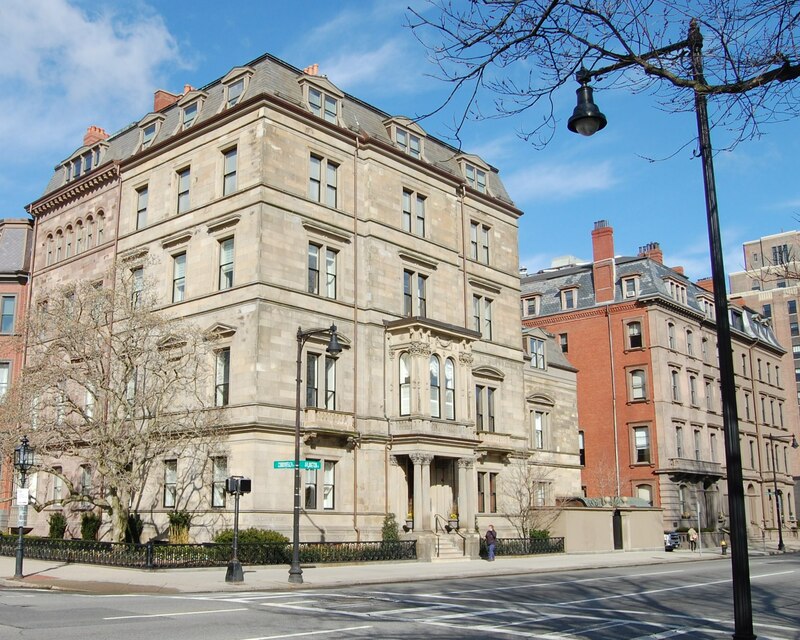 In his Houses of Boston’s Back Bay, Bainbridge Bunting does not identify an architect for either 1 Commonwealth or 12 Arlington. 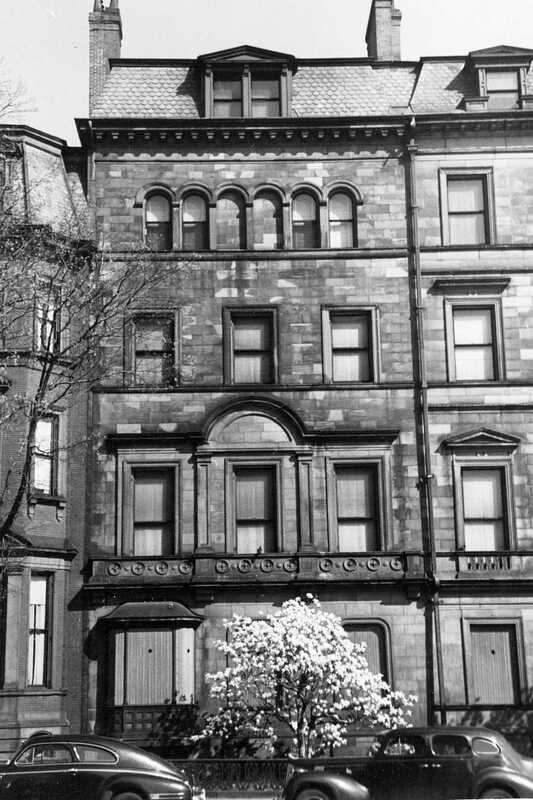 However, a May 25, 1860, article in the Boston Evening Transcript indicates that 1 Commonwealth was being built under “the superintendence” of architect Edward C. Cabot, and a May 15, 1863, article in the Boston Evening Transcript lists 12 Arlington among several houses designed by Arthur Gilman. The bulk of the land on which the two houses were built was purchased from the Commonwealth of Massachusetts on December 28, 1858, when John D. Bates purchased a 38 foot wide lot at the corner of Commonwealth and Arlington, and Samuel G. Ward purchased a 30 foot lot immediately to the west. On July 12, 1859, Samuel Ward sold John Bates a strip of land 3.5 feet wide, increasing John Bates’s lot to 41.5 feet in width. Construction of John Bates’s house began soon thereafter. On January 3, 1860, Samuel Ward purchased a 3.5 foot wide strip of land from the Commonwealth to the west of his current land, thereby restoring his lot to 30 feet in width, and construction of his house began soon thereafter. Click here for indices to the deeds for 1 Commonwealth and 12 Arlington. 1 Commonwealth was designed by architect Edward C. Cabot and built ca. 1861 as the home of Samuel Gray Ward and his wife, Anna Hazard (Barker) Ward. They previously had lived at 20 Louisburg Square. Samuel Ward was a merchant and banker, and was US agent for Baring Brothers Bank of London. 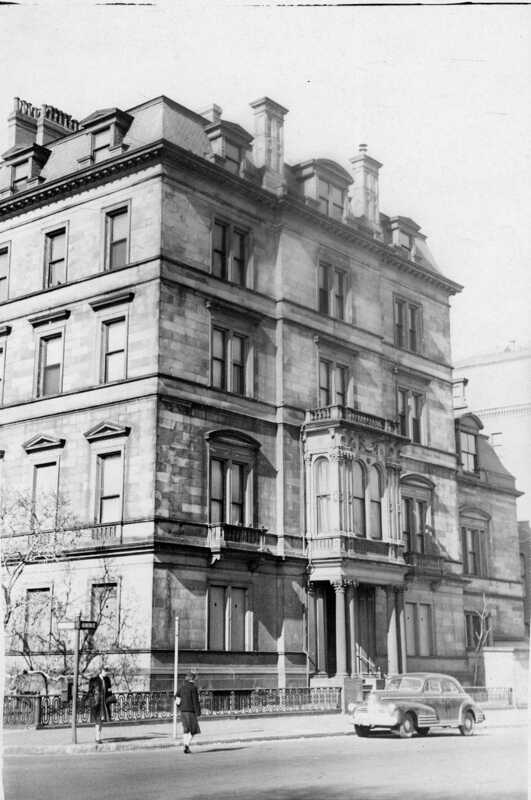 They continued to live at 1 Commonwealth until 1865, when they moved to New York City. On July 15, 1865,1 Commonwealth was purchased from Samuel Ward by Nicholas Reggio, an importer of produce and wine from the Mediterranean and vice consul for Italy. He and his wife, Pamelia Josephine (Miller/Carney) Reggio, lived at 1 Commonwealth by 1866. They previously had lived at 57 Summer with her mother, Pamelia J. (Green) Hazelton Miller Carney. Pamelia Carney was the widow of clothier and real estate investor Andrew Carney, who had died in April of 1864; she had been married previously to John Hazelton and John Miller, the father of Pamelia Reggio. Nicholas Reggio died in November of 1867. Pamelia Reggio continued to live at 1 Commonwealth. By the 1870s, she had been joined there by her mother. On December 14, 1872, Pamelia Reggio transferred 1 Commonwealth to her mother, who entered into a mortgage with the Massachusetts Hospital Life Insurance Company, and then transferred the property back to Pamelia Reggio on December 18, 1872. Pamelia Carney died in April of 1875 and Pamelia Reggio moved abroad soon thereafter. By the 1876-1877 winter season, 1 Commonwealth was the home of David Snow, Jr., and his wife, Georgianna (Coburn) Snow. They previously had lived at 157 West Concord. He was a fish dealer. They continued to live there in 1879, but had moved to Andover by 1880. On September 22, 1879, 1 Commonwealth was purchased from Pamelia Reggio by J. Ingersoll Bowditch, trustee of Mary Copley (Greene) Amory, the wife of James Sullivan Amory, under the will of her father, Gardiner Greene. By the 1879-1880 winter season, 1 Commonwealth was the home of James and Mary Amory. They previously had lived in Brookline. James Amory was a cotton manufacturer. Three of the Amory’s five surviving children lived with them: Frederic Amory, Augustine Heard Amory, and Harcourt Amory. Frederic and Harcourt Amory were members of their father’s cotton manufacturing firm. Augustine Heard Amory was an Episcopal clergyman. Augustine Heard Amory married in May of 1883 to Elizabeth Tilden Snelling. After their marriage, they lived in Lawrence where he he was Rector of Grace Church from January of 1884. James Amory died in June of 1884. Mary Amory, Frederic Amory, and Harcourt Amory continued to live at 1 Commonwealth. Harcourt Amory married in April of 1891 to Gertrude Lowndes Chase and they moved to 251 Beacon. Mary Amory died in April of 1892 and Frederic Amory moved soon thereafter. Under the terms of Gardiner Greene’s will, after Mary (Greene) Amory’s death, her surviving children — Arthur, Robert, Frederic, Augustine, and Harcourt Amory — inherited 1 Commonwealth. On May 31, 1892, they sold the property to Joshua Montgomery Sears. He and his wife, Sarah Carlisle (Carlile) (Choate) Sears, owned and lived at 12 Arlington. After acquiring 1 Commonwealth, they consolidated it with their home. 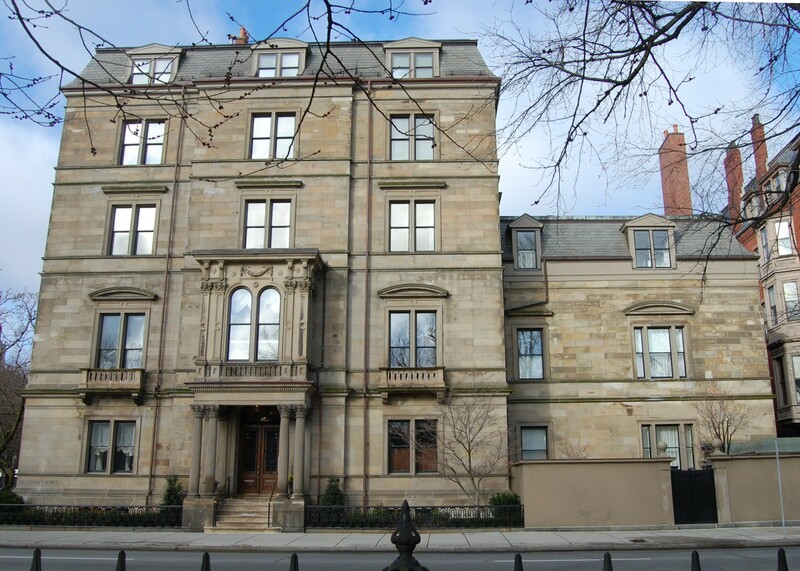 12 Arlington was designed by architect Arthur Gilman) and built ca. 1860 as the home of John Douglas Bates and his wife, Mary (Bordman) Bates. They previously had lived at 81 Mt. Vernon. John Bates was a shipping merchant dealing in the sugar trade and served as Danish Consul in Boston. He died in Europe in October of 1863. His wife and their son, John D. Bates, Jr., continued to live at 12 Arlington until shortly before her death in March of 1870. 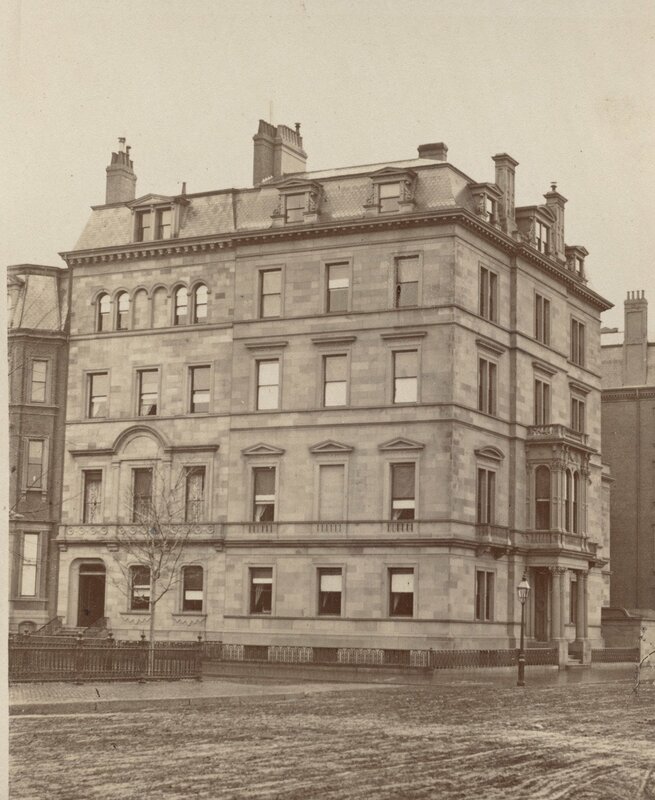 John Bates, Jr., moved to the St. James Hotel in Franklin Square, and then by about 1873 to a new home he had built at 161 Commonwealth. On January 3, 1868, 12 Arlington was purchased from John D. Bates, Jr., by William H. Bordman, a shipping merchant and real estate investor. On June 11, 1868, 12 Arlington was purchased from William Bordman by Nathan Matthews. He and his wife, Albertine (Bunker) Matthews, made it their home. They previously had lived at 56 Beacon. A former commission merchant, Nathan Matthews was a real estate investor. 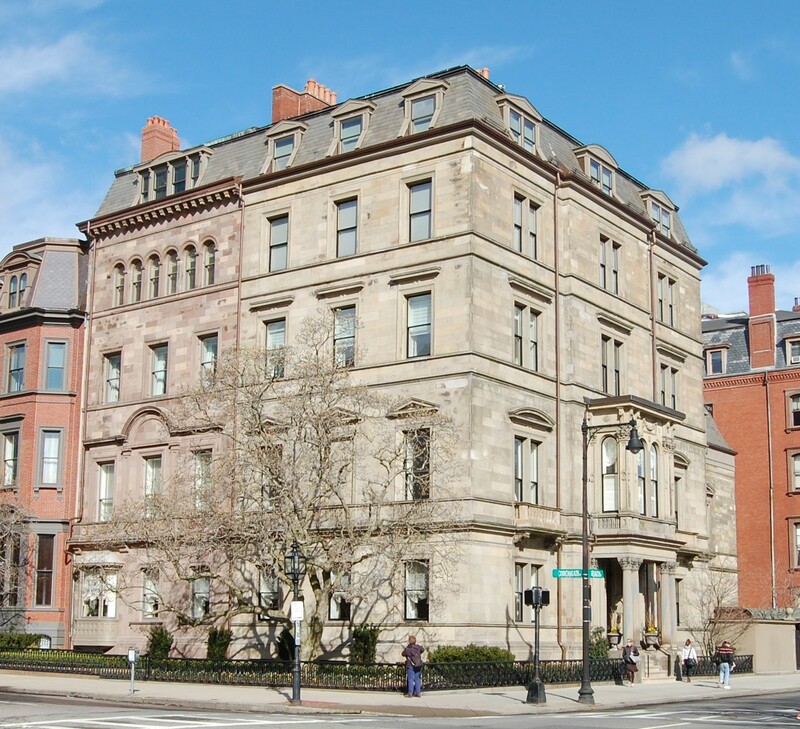 He was president of the Winnisimmet Company, which developed portions of Chelsea, and (between 1860 and 1870) president of the Boston Water Power Company, which developed a large part of the Back Bay. On May 27, 1876, as part of what appears to be a financial restructuring, Nathan Matthews sold 12 Arlington to Seth Turner and Frederick Lothrop Ames, who were creditors and also were trustees on behalf of several banks, that also were creditors of Nathan Matthews. 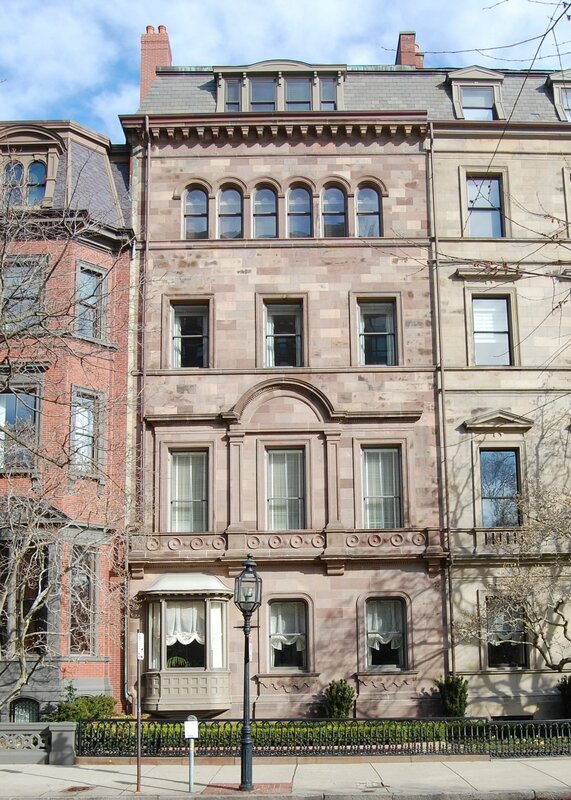 Nathan and Albertine Matthews continued to live at 12 Arlington until 1877, when they moved to 145 Beacon. On May 3, 1877, 12 Arlington was purchased from Seth Turner and Frederick L. Ames, trustees, by Joshua Montgomery Sears. J. Montgomery Sears was a real estate investor. 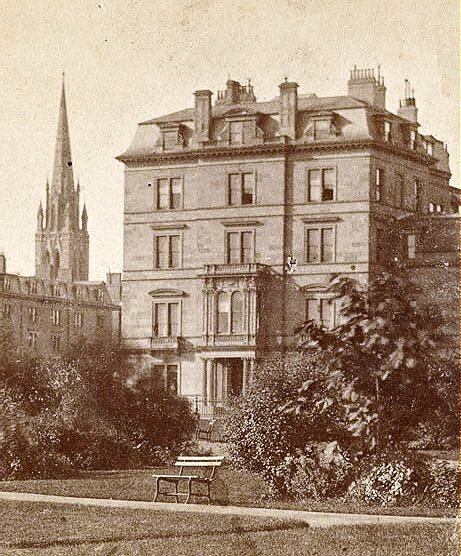 According to a September 19, 1877, Boston Globe article, he was “heir to the Sears estate in this city, reputed at $7,000,000 in value” and bought the house as a “bridegroom’s gift” costing $110,000 for Sarah Carlisle (Carlile) Choate, whom he married in September of 1877. Sarah (Choate) Sears was a well-known and respected watercolorist and pictorialist photographer. The Sears also maintained a home, Wolf Pen Farm, in Southborough. On May 31, 1892, J. Montgomery Sears acquired 1 Commonwealth and subsequently combined the houses, with the address of 12 Arlington. The entrance to 1 Commonwealth was removed and the second story was remodeled into a music room. J. Montgomery Sears died in June of 1905. Sarah Sears continued to live at 12 Arlington with her son, J. Montgomery (“Monty”) Sears, Jr., and daughter, Helen. Monty Sears was killed in an automobile accident in August of 1908. Helen Sears married in July of 1913 to James Donald Cameron Bradley. After their marriage, James and Helen Bradley lived at 12 Hereford and in Southborough. By the 1917-1918 winter season, the Bradleys had joined Sarah Sears at 12 Arlington. James Bradley died in December of 1928, and Helen Bradley continued to live at 12 Arlington with her mother. Sarah Sears died in September of 1935. After her mother’s death, Helen Bradley may have contemplated selling 12 Arlington/1 Commonwealth to Edward Wyner, owner of the Ritz-Carlton Hotel, inasmuch as in December of 1937, he applied for permission to build a 17-story apartment house on the site. The application subsequently was abandoned and Helen Bradley continued to live at 12 Arlington until about 1941, when she made Wolf Pen Farm in Southborough her home. The property was shown as vacant in the 1942 City Directory. By 1943, 12 Arlington/1 Commonwealth was leased by the Army and Navy Service Committee, which converted the building into an officers’ club, with dining, lodging, and recreational facilities. They continued to be located there in 1945. On December 31, 1945, 12 Arlington/1 Commonwealth was purchased from Helen Bradley and Sarah Sears’s estate by the Roman Catholic Archbishop of Boston. On November 19, 1947, the Archbishop transferred 12 Arlington/1 Commonwealth to Ursuline Convent, Inc., which converted the property into a day school and convent. On August 25, 1959, Ursuline Convent, Inc., transferred 12 Arlington/1 Commonwealth back to the Roman Catholic Archbishop of Boston. The Archdiocese eliminated the day school and converted the property into the Convent of Oblate Sisters. In June of 1966, the Diocese converted it from a convent into professional offices. On October 17, 1966, 12 Arlington/1 Commonwealth was purchased from the Roman Catholic Archbishop of Boston by Harbridge House, Inc., an international management consulting firm, which owned and maintained its offices at 10-11 Arlington. After acquiring 12 Arlington/1 Commonwealth, it occupied all four buildings. On July 31, 1987, Harbridge House transferred all four buildings to Sears, Roebuck and Company (by that time, Harbridge House was a wholly owned subsidiary of Sears World Trade, Inc.). On September 30, 1993, One Commonwealth Corporation purchased 12 Arlington/1 Commonwealth from Sears, Roebuck and Co. It remodeled the buildings into nine apartments, including adding an underground garage, and on September 27, 1995, it converted the property into nine condominium units, with the address of 1 Commonwealth, the One Commonwealth Condominium.